Kathleen Kruse and Geri Chuba scored 0.21 masterpoints with a 45.45% game at St. George Bridge Clubs. See full results of this game. 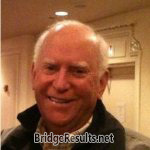 Kathleen Kruse and Geri Chuba scored 0.17 masterpoints with a 46.83% game at St. George Bridge Clubs. See full results of this game. Mary Lean and Norman Lean scored 0.32 masterpoints with a 52.08% game at St. George Bridge Clubs. See full results of this game. Kathy Kruse and Geri Chuba scored 0.22 masterpoints with a 47.54% game at St. George Bridge Clubs. See full results of this game. Mary Lean and Norman Lean scored 0.42 masterpoints with a 54.16% game at St. George Bridge Clubs. See full results of this game. Mary Lean and Norman Lean scored 0.35 masterpoints with a 51.19% game at St. George Bridge Clubs. See full results of this game. Mary Lean and Norman Lean scored 0.75 masterpoints with a ★60.88%★ game at St. George Bridge Clubs. See full results of this game.